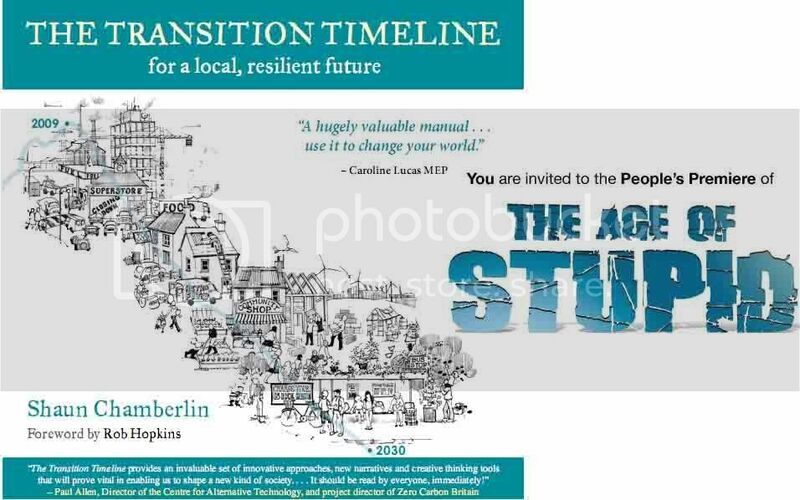 Transition Town Kingston are hosting a pre-launch celebration of my new book, The Transition Timeline, at the Kingston Odeon on the 15th March (this Sunday) from 5:30pm. This event will also form part of the nationwide People’s Premiere of new film The Age of Stupid, directed by the inspirational Franny Armstrong, produced by Oscar-winning John Battsek, and starring Oscar-nominated Pete Postlethwaite. Tickets for the event are £10 and can be ordered here. For this you will be amongst the first to see The Age of Stupid, enjoy a live satellite link-up to the simultaneous premiere taking place in a solar tent in Leicester Square(! ), witness the launch of the international “Not Stupid” campaign, and have the opportunity to discuss the film with both me and Hilary Gander, one of the founding members of the Campaign against Climate Change. I will also be selling and signing copies of The Transition Timeline at the Kingston screening, which will be the first opportunity for anyone to get their hands on a copy!